A BRIEF HISTORY OF THE FINGER LAKES LIVE STEAMERS, INC. The club is incorporated under the laws of New York State. Planning for the 7¼ inch gauge railroad has started. The second annual picnic takes place. Dave Conroy’s Atlantic is the first engine to run at the club along 170′ of point to point track that has been laid. The first piece of rail is laid on the elevated track. The club purchases a 4,000 gallon cypress water tank for $25. FLLS exhibits at the Pageant of Steam in Canandaigua, NY. The first posts are installed for an elevated track. This will become a dual gauge (3½ & 4¾) railroad primarily for ¾” & 1″ scale models to operate. The first picnic is held at Marengo. The club starts a newsletter to keep members informed and is called the Fin-Lay Pop Valve. Richard Alley is the first Editor. Work also begins at Marengo. The club leases approximately 12 acres of land, just west of Marengo, NY, with an option to buy. The constitution is accepted by majority vote. Membership is up to 70 members. The name of the organization is changed to Finger Lakes Live Steamers to better identify the name of the club with the geographical region that it would serve. A committee starts work on a constitution and by-laws for the club. 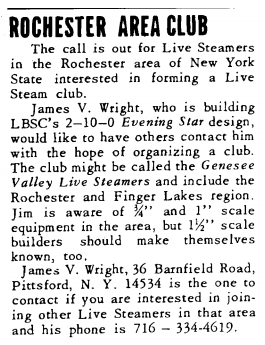 A photo and announcement of the newly formed club “Genesee Valley Live Steamers” appears in Live Steam Magazine. Jim Wright was elected President and John Eyster became Secretary/Treasurer. The primary goals were to search for potential new members and find a suitable location for a track. Jim Wright was born in England and educated there as a chemical engineer. Coming to this country, he took a job with a chemical company in Philadelphia and joined the Pennsylvania Live Steamers. Changing positions again, he came to Rochester where he discovered there was no live steam club. He wrote to Live Steam Magazine requesting all Live Steamers in the greater Rochester area meet at his house. Bill Fitt, then Editor, published his request and he had a good turnout, coming not only from Rochester, but Syracuse, Pulaski, and Fulton.